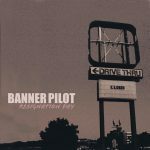 Banner Pilot’s first full length. Have to say I don’t think this one holds up that well. The songs blur together and nothing really stands out. If you’re a super fan of the “gruff Midwest melodic punk” sub genre you might dig it but I think we got a lot better and more interesting on the later albums. I’m quite the salesman over here! One note: we remixed and remastered this a couple years after the original release, and added in 2 songs from a split we did with the band Monikers. That’s the version available now.